ASIA/INDIA - An open letter from a Catholic priest: "Should Christians worship India as a Hindu goddess?" New Delhi (Agenzia Fides) - "Should Indian Christians worship the goddess India and offer Hindu rites in their churches or institutions? ": This is the provocative question Catholic priest Fr. Anand Muttungal, theologian, human rights activist and communication expert in the diocese of Bhopal asks in an open letter sent to Catholic Bishops and to Indian civil authorities. The priest felt the need to write an open letter, sent to Agenzia Fides, to point out "the stalemate existing with Hindu organizations, regarding the question of carrying out rites of adoration to Mother India in Christian institutions". The priest refers to the serious episode in which some militants of Hindu extremist organizations tried to force entry into the Christian college in Sagar in recent days to perform Hindu rites within the complex. The Hindu ritual they wanted to do is "Arati" (the Hindu ceremony of light) to "Bharat Mata", a representation of India as a Hindu goddess. 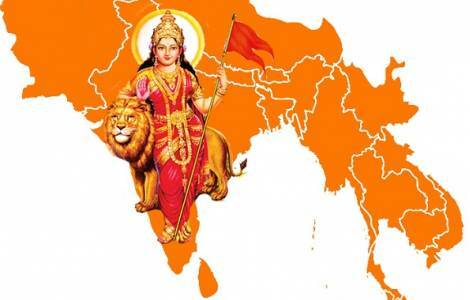 The pictorial form of "Bharat Mata" has become the symbol of Indian nationalism. And, as stated by well-known writer K.D. Menon "India's vision such as Bharat Mata has profound implications for the policy of Hindu nationalism". It entails, in fact, "the patriotic duty but also the religious duty of all Hindus to participate in the nationalist struggle to defend the nation". Today, notes Fr. Muttungal, Hindu fundamentalists consider all those who do not adhere to such practices (such as Indians of other religions) as "enemies" and "anti-national". The Catholic priest recalls that "the concept of Mother Earth originates from classical Greek culture" and is "above small ideologies". Also in the Catholic world one works to "save Mother Earth from global warming and climate change". "So we must not undermine the importance of the concept of Mother Earth", as Francis of Assisi also calls it, remarks Fr. Anand. Recalling the teachings of the Vatican Council and those of the subsequent East Asian Christian Conference held in Hong Kong, Fr. Muttungal recalls five points useful for confessing faith in Asia: Churches have the responsibility to learn cultures, to interpret cultures, to mediate with cultures, to create cultural values and therefore to belong to cultures. However, "we must resist any attempt by Hindu extremist organizations to insist that we must worship the picture of the goddess India. This is a personal aggression against the freedom of a believer of all monotheistic believers", the priest notes.